Think Tri! eat, sleep, everything triathlons: Running efficiently? You have Nike free and Newton running showing us the correct running stance, and coming out with shoes to help us adjust. So I decided to try something in the last couple weeks, force myself to run on the center of my foot pushing off with my toes. Most people land on their heels and roll through, from heel to toes, after adjusting my style, I know refer to this as LAZY RUNNING. At first I was a bit slower but my time have started to change over the last couple runs. I am running in a pair of Mizuno Wave Creation 8 and they are good shoes but since I changed my running style from a heel strike to a corrected running style things seems have change. The shoe feels heavy and my legs feel fast. I am now looking at a pair of NB 902, they are light and comfortable (I'll let you know how they turn out). 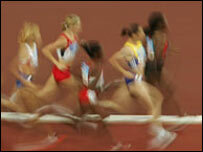 "All accomplished and elite runners run on the balls of their feet. The foot should strike the surface with the ball of the foot, in a dorsiflexed position (with toes pointing forward not downwards) otherwise this creates a" breaking" motion. The heel doesn't touch the ground. The foot on landing on the surface should be "light" not heavy, it then "grips and scrapes" the surface. The knee is slightly bent on contact with the surface and the foot lands below the centre of gravity - just below the hips. Think of your leg working in a circular motion from the hip joint. This brings the heel of the foot behind the body. The hamstrings and gluteus maximus (backside muscles) play a very big part in this movement. The thigh moves forward with the action of the quads and hip-flexors, the leg is extended and the foot drops again, landing on the ball of the foot as above. We call this cycling the leg! The hips and waist should be steady without a lot of side to side movement. The back should be straight and relaxed, not bent at the waist. The shoulders should be relaxed, The arms should be bent at approximately 90 degrees and the motion should be from the shoulder not the forearms. As the arm moves back it should continue to stay in 90 degree flexion. The hands should be held with the palm facing inwards not down. If you prefer to hold your hands in a fist, the thumb should rest on the forefinger. The head should be up with your eyes looking ahead not down. Beginner Triathlete, we've all been there!